We’ve talked about bruxing before – habitual tooth grinding and clenching. It’s an unconscious act that can happen day or night, during sleep or waking hours. It sounds uncomfortable – and is, often leading to pain in the jaw, neck and shoulders. But even while awake, bruxers are usually oblivious to the noise that can sometimes put others on edge (and even keep bed partners from getting a good night’s sleep). But why would someone brux anyway? Until fairly recently, there was a popular school of thought that poor bite alignment, known as malocclusion, was to blame. Yet while that idea has fallen into disfavor, there’s still no consensus on what makes people brux. Several triggers – including stress and medication side effects – have been identified. A study published last year in the Journal of Oral Rehabilitation verified what many dentists have long suspected: bruxism is related to temporomandibular disorders (TMD) and, by extension, depression. Although non-bruxers with painful TMD proved at higher risk for “moderate/severe depression and non-specific physical symptoms,” bruxers with TMJ problems were even more at risk. The authors couldn’t say that any one condition caused the others, only that they tend to occur together. A slightly later study, published in Pain, likewise found an association between TMD and depression and anxiety, which the authors said should thus be considered risk factors for TMD pain. Depressive symptoms are specific for joint pain whereas anxiety symptoms are specific for muscle pain, findings that deserve detailed examination. 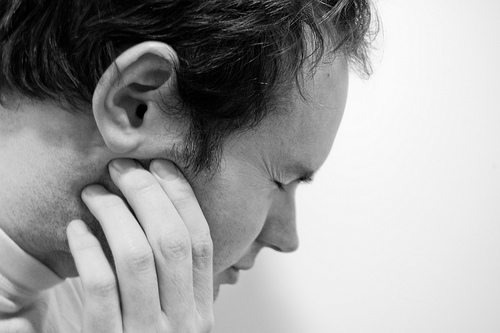 TMJ pain and its related problems aren’t the only trouble to come from bruxing. The constant grinding can cause physical damage to your teeth, too. It can wear them down and even fracture them. (Take a look at this gallery of suffering teeth.) Obviously, this has potential for financial pain, as well – but it needn’t come to that, not if we identify and address the issue early on. A quick visit to the dentist could be the first step to relief. We have many options for pinpointing problems and assisting in treatment. If you’re experiencing pain associated with bruxing, controlling or stopping the behavior usually alleviates the symptoms, but the associated pain can be treated independently, as well. For most people, a combination of behavior modification and splint therapy with a night guard or other appliance does the trick. Dr. E can steer you to the one that is most comfortable and best suited for your specific needs. Most people get used to their night guards very quickly. But don’t get too attached. Many patients find that, in time, the need for their mouthpiece disappears. As with devices for sleep apnea, there are over-the-counter night guards available. And just as with the apnea devices, they’re rarely effective. Most who use them experience no improvement and end up going to a dentist to get a custom splint, properly fitted and suited to their problem. A helpful hint: Just skip that extra step and talk with your dentist first. It’s your quickest way to a solution.